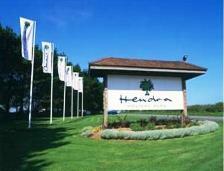 Hendra Holiday Park, Newquay, Cornwall, such a lovely site, we were blown away with it. Actually we were nearly blown away OFF it by the exceptionally high winds that prevailed whilst we were there but by strategically positioning our car we managed to prevent the awning being blown down. However we were blessed with plenty of sunshine - oops, that should read "rain", and rain it certainly did. Nevertheless we have to say that we had an enjoyable holiday and the weather only kept us in the 'van on two occasions. In true Brit fashion we sat on the beaches albeit wearing sweaters, waterproof anoraks, hats & gloves ! !